When no one listens, what’s the point of talking? 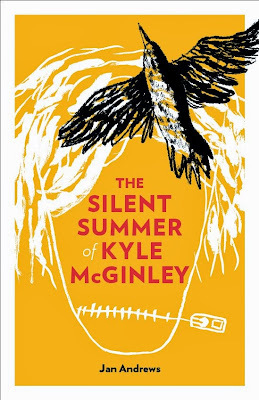 Kyle McGinley doesn’t say a word. Fed up with being shuttled from one foster care home to another, he has stopped speaking. But at the home of Scott and Jill Wardman, with the help of a crow, and a swamp, and an excess of blank paint, he begins to think that maybe, just maybe, life could be better. As long as his frigging dad doesn’t mess things up. What a hard book to review. I don't know if I liked it or not. Most of the book felt like I was reading a narration of a schizophrenic and what life was like for them. When you get to the end of the story and the extra voices stop, the story comes together cleverly. If you can handle a not-standard-style of writing, then this book is for you. I do know it won't be for everyone. I am also not sure how I feel about my teen reading it. This sounds very strange! Sometimes that is a good thing but not always. I think I'll pass.